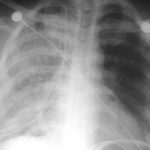 Re-expansion pulmonary edema is an uncommon event after chest tube insertion. Typically, patients have had symptoms of pneumothorax for several days, usually 3 or more. It occurs most often if a large amount of air (or blood) is evacuated at once. The patient will typically become symptomatic within an hour, with decreased oxygen saturation and subjective breathing difficulty. Although the mechanism is not entirely clear, it appears that the small blood vessels in the lung become more permeable if they are collapsed for an extended period. Mechanical stress from rapid re-expansion further damages the vessels, allowing them to leak. This leads to oxygenation and ventilation problems if severe. Check the history. Most of these patients have had their pneumothorax for 3 or more days. Check the xray. Complete pneumothorax (or large hemothorax) puts the patient at high risk. Modify your chest tube insertion technique. Clamp the distal end of the tube so the pneumothorax is not evacuated suddenly as the tube goes in. Modify the collection system. Do not use suction initially; only set up for water seal. Clamp the tubing on the patient side. Every 10-15 minutes release the clamp and briefly let some of the air out of the chest, then reclamp. Repeat this until all air has bubbled through the water seal chamber. Watch your patient. If they cough excessively, start to desaturate or become dyspneic, get your respiratory adjuncts. Give higher inspired oxygen by appropriate means, and consider BiPap or CPAP. In extreme cases intubation may be needed. If the patient does not have any difficulties after about an hour, connect the collection system to suction and proceed as you normally would. Reference: Reexpansion pulmonary edema. Ann Thoracic Cardiovasc Surg 14:205-209, 2008.